This game was confusing, arcane, and surprisingly satisfying to learn. I FINALLY managed to get to level J (as far as I can tell), albeit without fully understanding what white space meant. I know I'm late to the party, but I really enjoyed this mind-numbing experience. Also, what's up with Eve and Adam? Those ones were especially weird. I never even saw Adam- I got to J after only seeing one of the two. 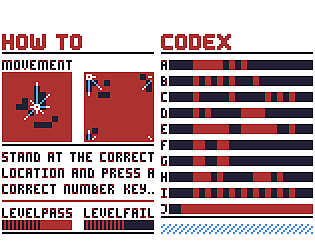 The manual was nice, but sometimes hard to understand : while I really liked the way movement was described in two pictures, it took me a lot more time to understand that the player's "size" was not (always ?) equivalent to a pixel in the image, resulting in confusion when trying to reason on the map. I also could not understand how to treat the white pixels in the map : are they supposed to act like red or black squares ? Finally, I gave up trying to distinguish between The Adam and The Eve. Is there something I missed, a hint that could help me advance without spoiling the whole thing ? Great game but also very difficulty for me to understand. Colors are well chosen! Once I grabbed writing tools it became a very interesting puzzle. A great lesson on minimal information! While so many 2D games provide as many game statistics via UI as possible, the refreshing anti-omniscience of a game with one sensory dimension proves to be equally immersive. Very cool! Took me a while to get what was going on, but once it clicked I managed a handful of levels. The last few ones were too hard for me, though. But I may return to it later! pen and graph paper strongly recommended!